In a sense, it was to be expected. 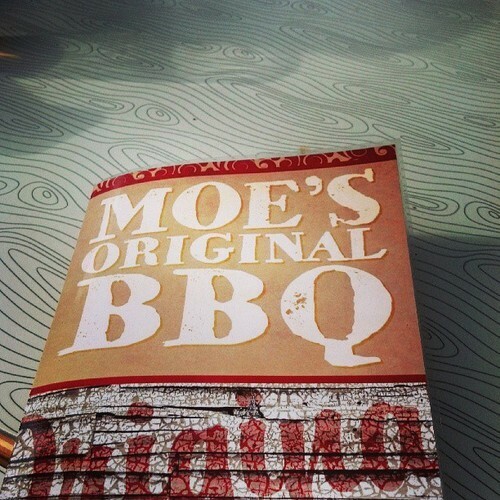 Moe’s Original Bar-B-Que is an Alabama-style barbecue chain restaurant based out of Colorado (not exactly a barbecue capital), and the Barbecue Bros don’t usually have high hopes for chains for a reason. Still, I was going to give it a shot since it had just opened last week and my current client is down the street. So this past week a few folks from my company decided to have a small work happy hour there. Moe’s moved into a building vacated by Pure Taqueria earlier this year and took a few months to fit it to their needs (more taps, smoker, etc). The building is modeled after an historic Matthews gas station and has garage doors that can be opened to give it an open air feel – oddly they weren’t open on this warm late spring night. As you walk in, you order your food and drink at the bar and take a number before they eventually bring it out to you which I have to say is kind of a weird set up, especially if you plan on having a couple of beers and have to keep going back to the bar to order. Speaking of beers, Moe’s does do a great job of keeping local beers on draft (I had a Olde Hickory Jade IPA and a Birdsong Red House Wheat and I believe NoDa Brewing, Triple C, and Old Meck were all represented) but charges $5 a beer with no beer specials anywhere to be found. At the bar (again, still weird to me), I ordered the pulled pork platter which came with a drink (non-alcoholic), cornbread, and two sides (collard greens and mac and cheese for me). The price for the platter was $10.25, which strikes me as a little on the pricey side. The food came out shortly after ordering and I quickly noted the relatively small portion sizes for the price and compared with other barbecue restaurants. However, none of that other stuff really matters if the barbecue is of high quality. Which is to say, sadly it was not. 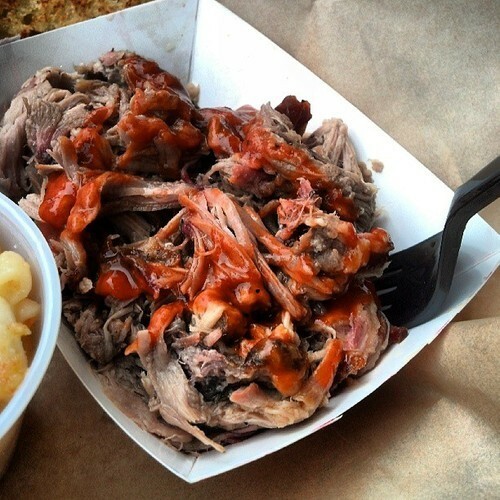 The consistency of the pork was fine, but overall it was dry and lacked smoke. There was a tangy reddish-brown sauce on the pork which somewhat helped with the dryness of the coarsely pulled chunks (another knock), but it wasn’t my jam. Since Moe’s is an Alabama barbecue restaurant there is the option to get an Alabama white sauce with your pork. Needless to say, I stayed far away from that mess. 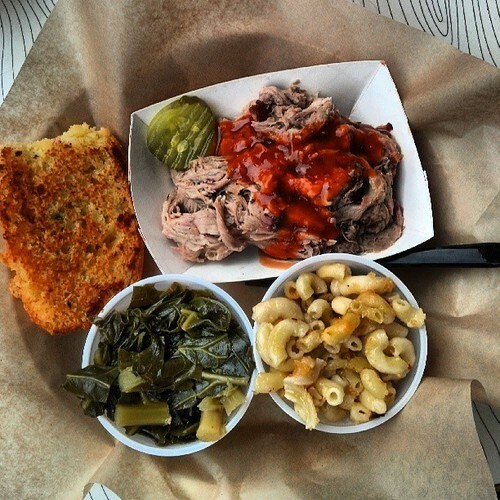 All of the sides were fine – the collards came with bits of sausage and bacon, the mac and cheese was baked, and the cornbread had some nice sweetness (but it really just ended up making me wish hush puppies were on the menu). 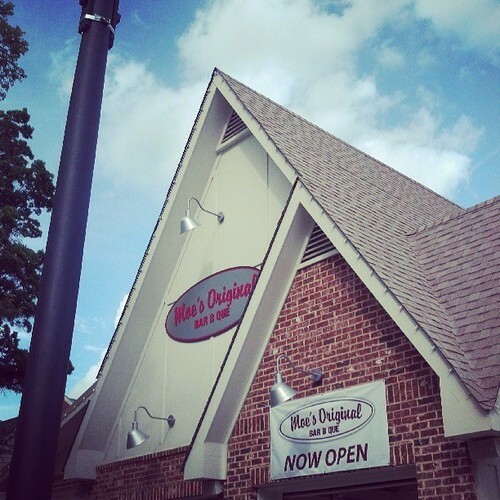 So yea, Moe’s Original Bar-B-Que ended up being more or less as I expected. I won’t pitch a fit if folks want to go there in the future, but it just likely won’t be my idea.